will definitely prey on people. Black bears are omnivorous, and although they eat mostly vegetative matter, meat is a very high energy food and they seek it out whenever possible. They prey on deer fawns, moose calves, and on livestock, and were responsible for a statistically significant amount of the deaths of the caribou released in Maine’s Caribou Restoration Project. Although it is not common, it is well documented that black bears will stalk and attack humans as prey. In Maine, State and newspaper reports document at least 10 attacks since 1980 that resulted in injury, and I personally interviewed two victims of predatory bear attacks in Maine since 1991, that did not appear in the general media or State records. This does not include unreported incidences where the bear approached with predatory intent but was driven off, or where people were being stalked unawares. Predatory black bear attacks on humans occur all across North America, and have been studied extensively. Canadian James “Gary” Shelton has studied both grizzly and black bear attacks in British Columbia (BC), and is an internationally acknowledged expert on the topic, and on defending yourself from these attacks. Since 1990, in BC alone, Shelton has investigated 20 black bear predatory attacks on humans, of which eight were fatal. He has investigated 40 additional incidents where the bear made predatory advances, but was driven off or killed before they made physical contact with a human. He has also heard of, but was unable to verify, many other incidents. He feels that there are probably several hundred cases each year in North America where black bears follow people unseen, with predatory intent, but eventually decide it's too dangerous to attack, and leave with the people never knowing they were stalked. He has written three classic books on bear attacks: Bear Encounter Survival Guide; Bear Attacks: the Deadly Truth; and Bear Attacks: Myth and Reality. 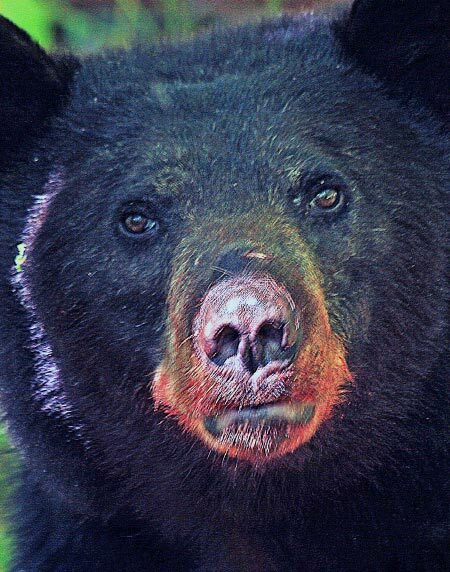 I first contacted Shelton in 1991, to ask him about what I considered the unusual behavior of a black bear in an attack I’d written about for the Maine Sportsman. The bear had stalked the man, approached cautiously with its hackles raised and lips peeled back to expose its teeth, and stopped whenever the victim confronted it face to face, but relentlessly pursued and attacked him. During the entire attack the bear was completely silent; it never made a sound, not even a slight growl or grunt. It was focused intently and completely on eating the man. Shelton told me that this was classic black bear predatory behavior, complete with the raised hackles and bared teeth, the deliberate stalking, the relentless and persistent attacks, and the total silence, one of the most unnerving elements of a predatory attack. He pointed out that bears are well aware that humans can be dangerous to them, and they weigh each situation carefully to assess the risk of attacking a potentially dangerous, large animal against a potentially rich, large food source. That, he said, is why smaller people are more at risk – and children are the most vulnerable. Simply, they are safer for bears to kill. Bears are large, powerful, and unpredictable, and will eat meat when given the opportunity. Predation on humans is a serious concern. Naaman Pratt photo. If Question 1 passes and our bear population increases dramatically and moves into heavily settled areas, as it has in all other states where bait and dogs were banned by referendum, and they consume most natural foods, these starving, predatory bears are exactly the kind Maine citizens will encounter. Shelton has stated repeatedly that this increase in attacks in British Columbia is a direct result of overprotection of bears and severe limitation of hunting opportunities due to anti-hunting groups, and subsequent uncontrolled growth in bear numbers. Predatory attacks on humans are most common in years when natural food sources, like mast or berry crops, fail, which happens regularly and naturally every several years. It also happens when bears come out of hibernation excessively hungry, or when bear populations are so high and competition for food is so fierce that there isn’t enough food to go around, and some bears are starving. On page 239 of Bear Attacks: the Deadly Truth Shelton says, “One of the most dangerous bears of either species (black or grizzly) is a bear just experiencing its first repeated exposure to humans.” This is exactly the type of bear Mainers will experience if Question 1 passes and we lose the ability to manage our bear population. In late September 2014, a 300-lb. male black bear killed a 22-year-old male hiker in New Jersey. New Jersey has an exceptionally high bear population density, due to very restricted hunting regulations.